iLoveToCreate Blog: How to throw a TIE DYE party! How to throw a TIE DYE party! Last month, we hosted a fun tie dye party in our backyard for some super creative local high school girls. They had a blast making everything from shirts to shorts to socks. They tie dyed everything, including their hands! Here's a fun guide on how to throw a tie dye party of your own. Tie dye is a great team-building activity to do at slumber parties, birthday parties, and church and club events. Here's how you can plan to tie dye at your next event! Get your space prepared for your guests. Have a table dedicated for foods and snacks and one dedicated for dyeing. Lay down a tablecloth and place your plastic water bin, bucket, and kits on the table so they can be easily accessible for your guests. Also reserve an area on the grass/pavement to lay down your surface covers. Your guests can lay their finished projects on the surface covers or use the covers as an area to do their dyeing. You will find that some guests want to go off and do their own thing! 1. Give each person a pair of gloves from the kit. Have guests fill up the tie dye bottles using the water pitchers. You could do this step prior to the party, but it's a fun part of the process that your guests might like to do themselves! 2. Have guests look over the instruction guide and decide which tie dye style they would like to try. 3. Have each guest wet their items and wring them out prior to applying dye. 4. Guests can choose to dye their items using a bucket or by spreading out their item and dyeing it on the ground. The bucket method is a bit cleaner, because it contains all the dye and limits mess. If using the bucket method, wipe it out well with paper towels after each use, so that dye doesn't get on the next persons item. 5. Let your guests play and experiment with the dye. The process is so fun and they'll have a blast trying out new techniques. The girls had a blast dyeing their cut-off shorts in a variety of colors. Tie dye doesn't have to be just t-shirts. 6. When guests are done, have them wrap their dyed items inside the surface covers or plastic bags. Tell guests to let the dye sit in the bag for 6-8 hours for most intense colors. Fully rinse dyed fabric in warm water until all extra dye is removed and water runs clear - removing rubber bands if used. Fill washer to large load setting with hottest water suitable for the fabric and a small amount of laundry soap. Wash and dry separately. Wash the item separately for the first few washes. 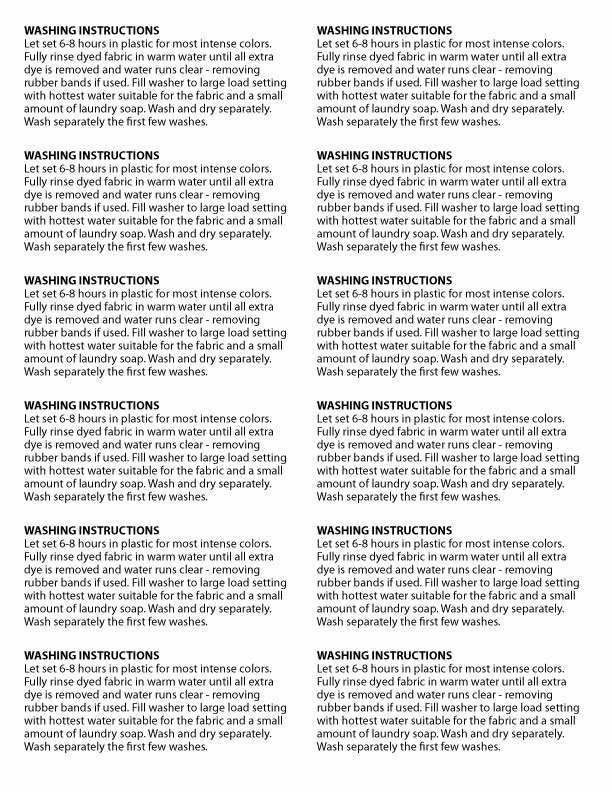 Here's a printable washing instruction guide that you can clip and give/attach to each bag so they can remember the directions once they are home. 7. And don't forget to enjoy your yummy drinks and snacks! Some of our guests got a little tie dye on their hands (they took off their gloves). No need to worry, though, the dye is safe and will wash off after a day or two! As you can see, our guests had a blast using the Tulip One-Step dye for a party. It's the easiest dye to use for your next party, is perfect for all ages, and of course, it's the most fun! Happy tie dyeing! I had my 1st tye-dye last week w/lots of cousins making their own shirts so much fun! And way easier than I thought! If an earthquake, hurricane, winter storm or other disaster strikes your community, you might not have access to food, water and electricity for days or even weeks. Some men are not comfortable talking about male enhancement products. When this topic is tackled, they feel some sort of nervousness. In fact, they prefer not to have it as a topic in any conversation. If you are interested in having business in excavation, you will find that this might be totally different with other businesses. Anyone dealing with construction site regulation compliance issues knows that it's not an easy job. Federal, state and local laws impact many facets of construction work, and keeping up with what seem to be constant changes can be overwhelming. Compliance with the laws is vital, though, no matter how new they are.